Letitia Elizabeth Landon was born on 14 August 1802 in Chelsea, London to John and Caherine Landon. The family moved to the country in 1809 so that John Landon could carry out a model farm project, and Letitia was then educated at home by her cousin Elizabeth. Elizabeth, though older, soon found that her knowledge and abilities were outstripped by those of her precocious pupil. 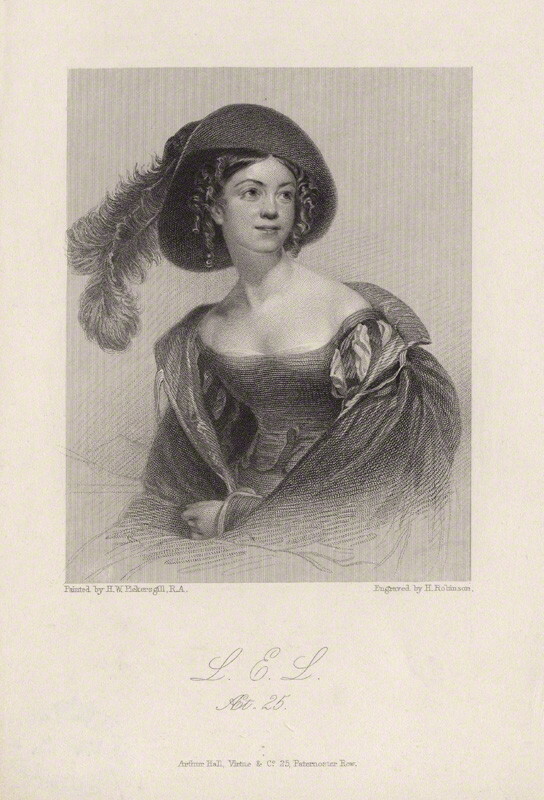 Jerdan encouraged Letitia’s poetic endeavours, and her first poem was published under the single initial “L” in the Gazette in 1820, when she was 18. The following year, with financial support from her grandmother, Landon published a book of poetry, The Fate of Adelaide, under her full name. The book met with little critical notice but sold well; Landon, however, never received any profits, as the publisher went out of business shortly after. The same month that The Fate of Adelaide appeared, Landon published two poems under the initials “L.E.L.” in Gazette; these poems, and the initials under which they were published, attracted much discussion and speculation. Landon served as the Gazette’s chief reviewer as she continued to write poetry; her second collection, The Improvisatrice, appeared in 1824. Landon’s father died later that year, and Landon was forced to use her writing to support both herself and her family. By 1826, Landon’s high reputation began to suffer as rumours circulated that she had had affairs or secretly borne children. Landon continued, however, to publish poetry, and in 1831 she published her first novel, Romance and Reality. She became engaged to John Forster who became aware of the rumours regarding Landon’s sexual activity, and asked her to refute them. Landon responded that Forster should “make every inquiry in [his] power”. Privately, however, Landon stated that she would never marry a man who had mistrusted her. In October 1836 Landon met George Maclean, governor of the Gold Coast, at a dinner party. The two began a relationship and were married on 7 June 1838. Their marriage was kept secret though and Landon spent the first month of it living with friends. In early July the couple sailed for Cape Coast but three months later, on 15 October, Landon was found dead, a bottle of prussic acid in her hand. It appears that she showed symptoms of Stokes-Adams syndrome for which the dilute acid was taken as a remedy. In retrospect is seems almost certain that Landon suffered a fatal convulsion. Her reputation, while high in the 19th century, fell during most of the 20th as literary fashions changed and Landon’s poetry was perceived as overly simple and sentimental. In recent years, however, scholars and critics have increasingly studied her work, beginning with Germaine Greer in the 1970s.